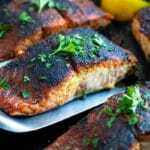 Blackened Salmon is an easy low-carb and keto salmon recipe that can be made in a cast iron skillet or baked in the oven with a homemade blackened seasoning mix in under 15 minutes. Mix together your blackened seasoning ingredients. Cut salmon into 5 filets and leave the skin on. Sprinkle 2 tablespoons of the seasoning mix over the salmon filets. Heat up butter, or dairy-free “butter”, in a large cast iron or stainless steel skillet over medium-high heat. Place salmon filets into the skillet flesh side-down and cook for 4-5 minutes. Preheat oven to 450 degrees. Line a large baking sheet with either aluminum foil or parchment paper. Place salmon filets in a single layer and divide cubed butter between the fillets. Bake in preheated oven for 10 minutes, or until internal temperature reaches 145 degrees and fish flakes easily with a fork. Serve blackened salmon immediately with lemon slices and a sprinkle of parsley. Enjoy!